Send Spy Module & Start Spying! 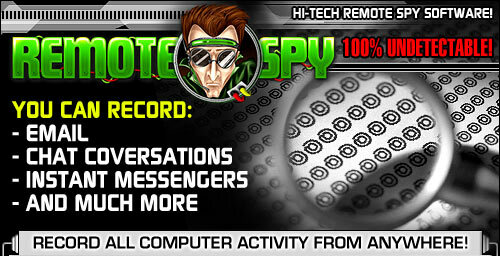 The most powerful remote computer spy software of it's kind, it's finally here RemoteSpy! Secretly and covertly monitor and record any computer without the need of physical access. Record keystrokes, find passwords, read emails, monitor instant messenger conversation, view chat conversations, view web sites visited + More in total privacy. Find out the information you need to know quickly with the most intelligent spy software available Remote Spy! Remote Spy is the latest in high-tech remote computer spying PC surveillance software. Secretly and remotely deploy this powerful spyware and record all computer and Internet activity remotely with our powerful yet simple to use Spy Software. Remotely record Keystrokes, Current user, Instant Messengers, Web sites Visited, Application Usage, Window titles, Find Passwords & Usernames, Secretly Record Chat Conversations and more!! See RemoteSpy's full feature list. Like a RAT (Remote Access Trojan) RemoteSpy is a Powerful Spy Software Remotely Install No Physical Access Needed!